Saving the sweet potato: Could little fire ants be the solution? With traditional diets in island countries based on root crops and indigenous vegetables, sweet potato is one of the main staple root crops and means of income for many Solomon Island families. However, the potential for major attacks from the sweet potato weevil, causing severe damage to both the vines and storage roots of these vital crops, is pushing scientists to look into how communities around the world are managing this without pesticides. Enter, University of Queensland, School of Biological Sciences PhD Candidate, John Fasi and the Wasmannia auropunctata, AKA the Little Fire Ant (LFA). Surveying for sweetpotato weevils on sweetpotato plots on the out-sketch of Honiara in Solomon Islands. With evidence in some instances that LFA on sweet potato plots has some effect on the population of sweet potato weevil, Fasi, set out to determine whether LFA could be used as an effective biological control. Over 85% of Solomon Island population lives in the rural areas relying mostly on root crop such as sweet potato. With a fast turnover rate (between 3 – 4 months from planting to harvesting), sweet potato is seen as an ideal root crop for both consumption and cash crop. With sweet potato farmers in the Solomon Islands not relying on pesticides, a pest outbreak can result in huge loss to the subsistence farmers, thereby affecting their livelihoods. 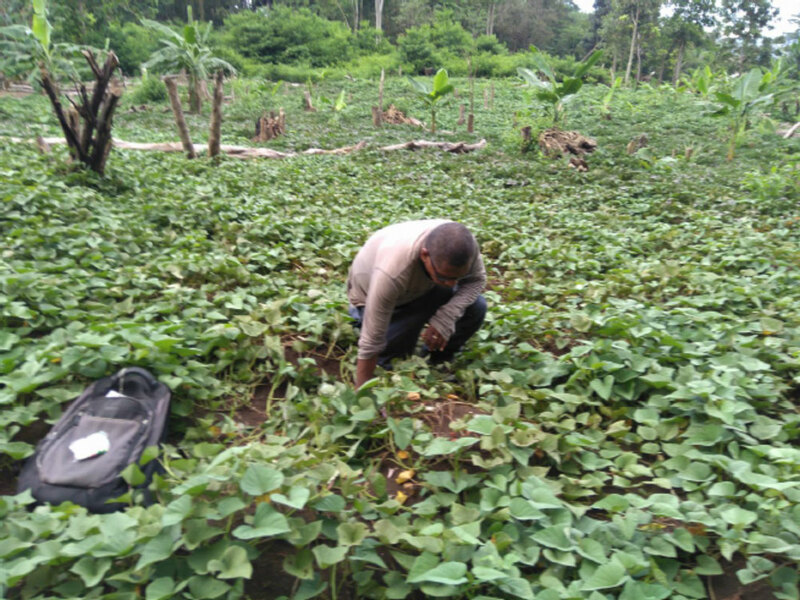 So, understanding how sweet potato crops in Solomon Islands withstand pest infestation without the use of insecticides, can help in reducing the use of pesticides. Surplus sweetpotato are sold in the local market mostly by women. 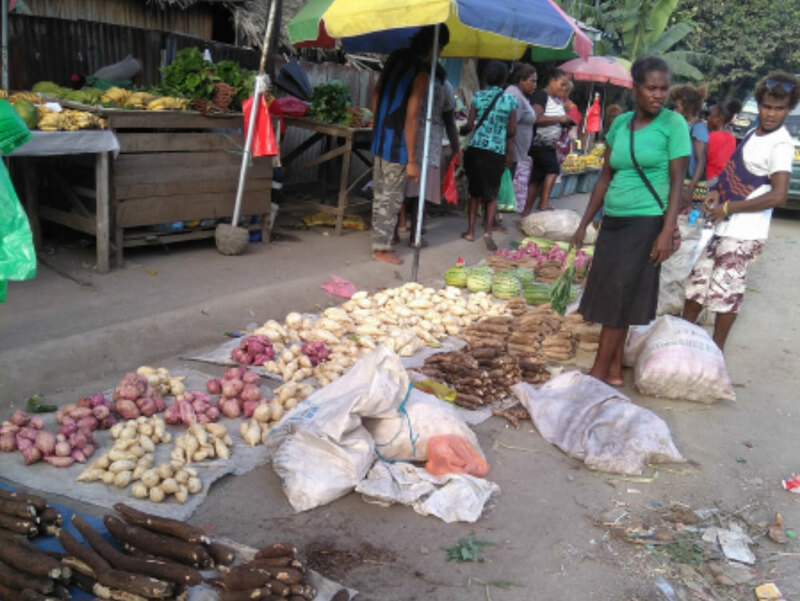 Thanks to funding from The Crawford Fund, John travelled to the Solomon Islands to further his research in this area, visiting sweet potato plots in villages around Honiara, Sanata Ana, and interviewing market vendors in the Central Market and Eastern end of Honiara. Fasi was about to survey for the presence of LFA and their effect on sweet potato weevil. Although correlative, his study strongly suggests LFA impacts on sweet potato weevil on sweet potato plants and, although this invasive ant is detrimental to other arthropods in general, it may contribute to the control a pest of sweet potato. While it’s not the intention of this study to spread LFA between sweet potato plots, Fasi’s research indicates the need to further investigate activities of other ant species (native or introduced) on sweet potato plots. John’s trip to Solomon Islands is part of our efforts to support and encourage young Australians in study, careers and volunteering in international agricultural research, our International Agricultural Student Awards from Crawford Fund State Committees will be supporting 14 Australian tertiary students to gain international agricultural research experience and expertise.